Have you ever noticed that Trader Joe’s employees are constantly speaking to each other in an overtly cheerful manner about politics and sports? This is the first sign that something is very wrong. The second, in my opinion, is that games and parties aren’t invoked so much as the upbeat rhythm of socially engaged banter. I once heard a Trade Joe’s employee exclaim, “How about those teams? !” to a bag of baby broccolini. I think it was practice. 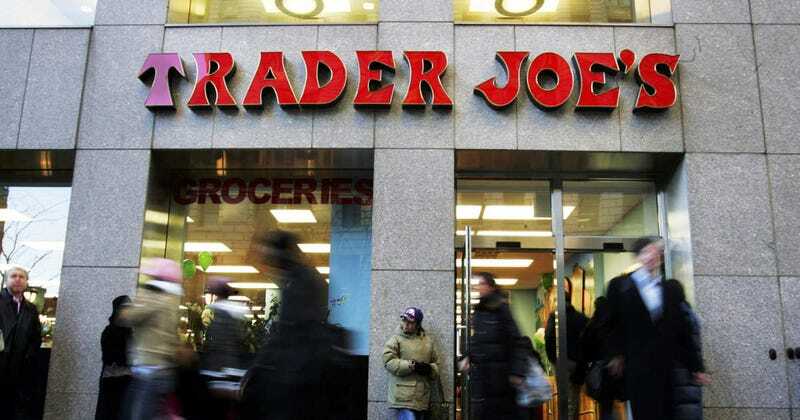 Perhaps I go to Trader Joe’s too often, or it’s a New York-specific issue, but something always seemed off—and not with the workers so much as with management. Nor am I by any means the first to notice. In case you are unfamiliar with the store, perhaps because you don’t live near one of its 459 locations, they sell high-end food products (like truffle flavored raviolis and crackers with blue cheese already baked inside of them) for relatively low prices, and have notoriously secretive ownership. Nagle also claims some workers have been sickened by stockroom fumes and hurt by falling food products, and that, in his experience, “managers appeared to harass worker for the sport of it.” I wonder if this is what employees are actually discussing.